Orthodox and Muslims alike looked to Russia’s multicultural past for examples of how believers of different faiths can get along. Russian Orthodox Metropolitan Hilarion took an historical perspective, reminding the audience that during the Imperial era, the Russian state was tolerant of its Muslim citizens. Rather than imposing Orthodoxy as a state religion, the emperors granted some leeway to other faiths based on the loyalty of local elites to the crown. The metropolitan did note that Imperial Russia did not resolve its issues with Catholics or Jews, but did not expound on this point. 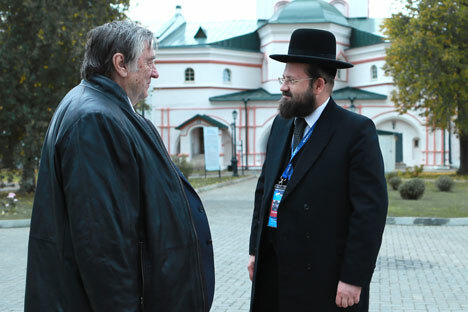 When questioned about the increasing influence of the Russian Orthodox hierarchy over the government, the metropolitan replied quite frankly that he wanted to see this influence extend even further. Echoing this sentiment, church spokesman Archpriest Vsevolod Chaplin explained that the church takes its role questioning society’s values very seriously. Along with commenting on general social trends, the church has also looked into the way business is conducted and training for civil servants. Both clergymen encouraged the West to accept Russia’s different cultural experience and try to listen to Russia’s arguments more attentively. The Muslim representative, Mufti Damir-Hazrat Mukhetdinov, deplored the increase in Islamophobia in Russia. “A Muslim neighbor is considered a stranger rather than a compatriot,” he said, pointing out that there had been a Muslim presence in Russia for more than 1,000 years. “Why does the lezginka [a Caucasian folk dance], when danced in the streets of Moscow provoke reactions of rejection, while when the lezginka was danced in the streets of Berlin in 1945 it inspired pride?” Mukhetdinov asked. He said there are approximately 27 to 28 million Muslims currently living in Russia. Several members of the audience spoke up to prevent the discussion from becoming too politically correct. Publicist Alexander Prokhanov accused the Orthodox church of dividing Russians into “reds” and “whites.” To this, Hilarion replied that there was no question of forgetting the historical crimes committed by the Soviets, but that there was a need to forgive and move forward. When questioned by Gennady Goudkov about radical Islam and how the Muslim community intended to confront this danger, Mukhetdinov replied that it was necessary to educate young Muslims so that they do not fall under the influence of radical Islamic groups. In answer to the question of whether it would be possible to negotiate or come to an arrangement with the radical Salafi and Wahhabi branches of Islam, he replied that it was not. “If you do not agree with them, they have two options – either to exterminate you or to convert you. And any way of doing so is fine with them.” No one tried to dispute this observation, however it seems that there were no Salafists or Wahhabis in attendance.